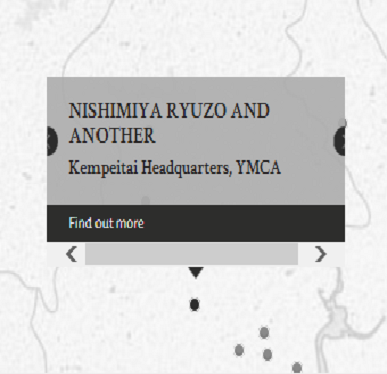 Singapore civilians - Hugh Peter De Souza, Clement De Souza, Richard Simon, Hoe Boon Leong, and Yap Keng Soon - were arrested by the accused, Nishimiya Ryuzo and Yagi Chosei, who were civilian policemen. The accused brought the victims to the police station, where they were interrogated and beaten, and then sent to a Japanese court for trial. Both Nishimiya and Yagi were civilian Japanese police officers. Unlike other defendants, Yagi chose to plead guilty. This was unusual, so the court allowed him time to reconsider and also emphasised that the court may alter his plea based on evidence that may arise during trial, though eventually it did not. After his cross-examination, Yagi looked so unwell that the Court President asked after him. He was "doubled up" from malaria, and the President excused him from court. Nishimiya, Ryuzo. Civilian from Japanese police. From Japan. Guilty. 4 years' imprisonment. Sentence confirmed. Yagi, Chosei. Civilian from Japanese police. From Japan. Guilty. 4 years' imprisonment. Sentence confirmed. Ward. Major. From British military. Sinclair, Donald Frank. Captain. From British military.